I had the Delta for about 5 years … mine was a solid performer. Never a problem, plenty of power … I just wanted a lathe with bigger swing. If I had the room, I would have kept the Delta when I got the new lathe. I have had the delta for 2 1/2 years. I turn everything from pens to bowls and it works flawlessly. I know there were some issues with these a while back, but mine has been great. (and I turn a lot). I was looking at the jet when I bought it too, not an easy choice. Good luck! Had my Delta for about a year, and have been exceedingly happy with it. Have done a couple small bowls, a set of tap handles, about 2 dozen pens, and a pedestal for a candle stand. Once my shop is arragned a little better, I’m seriously considering the bed extension for it. ... I’m seriously considering the bed extension for it. I had the bed extension on my lathe … came in handy for turning longer spindles. Also was nice to just be able to slide the tailstock back when hollowing. Thanks for all the responses so far. Looks like you all have the Delta and are unanimously pleased with it. Wonder if anyone on this forum with a Jet will come along and provide input. ... I m seriously considering the bed extension for it. And Hockey, if money isn’t a problem, I wouldn’t sweat this decision too much. From what I’ve heard regarding these two lathes, I don’t think you’d regret either one. I have the Delta with the bed extension, and I’ve been quite happy with it. If they’re at feature parity, I can’t see a reason why you shouldn’t buy the less expensive Delta. I have the Delta and have been very satisfied. Smooth, powerful, quiet. Thanks again for all the responses so far. Anyone have any vibration with either lathe without anything mounted to it (no chuck, no face plate and no wood)? I have the 1221vs and am quite happy with it. It followed up the 1014evs. 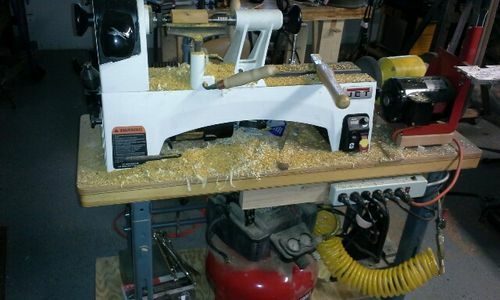 I use my Jet 1221 every day even though I have the newer larger Jet 1640 lathe. I will not give up the 1221. It’s that good. Both are great choices. We use a 1221 at work and it performs flawlessly. A friend at work has the delta and it has never let him down either. I would hate to have to make the choice. The Comet II is a good budget lathe and I think the current version fixes some of the issues I had with mine. If I were a pen turner, the Comet II would probably be my choice considering how inexpensive it is right now. Having owned both a Comet II and Delta Midi 46-460, the Delta is worth the extra money. For more general purpose or bowl turning, the Delta is heavier, beefier, has a lot more power. Thanks again for all the responses. I have decided on the Delta (was able to get it for $200 less than I could get the Jet). Ordered it; but, not too late to change my mind at this point. So, speak now or forever hold your peace (big grin). I have and love my Delta for the past ~5yr. Go Delta! I have zero experience with a Jet, but owned a Delta and loved it. Mine had an extension, I bought the extension, stand and stand extension at the time I bought the lathe. I had saved a little money and decided to go all the way. It served me well. I never really used the extension for turning longer spindles but it is VERY handy to have that extra bed to push your tail stock back to get it out of the way, and I had a Rockler round storage tray for items…on and on. It’s just handy to have that extra space for multiple reasons. I took the feet off the stand and installed wheels and that made it even more versatile. I eventually bought a bigger lathe, and thought I would keep it, but I did not use so I sold it a month ago or so. I had heard that at one time on another blog that the Jet’s were have switch issues after a couple years, I am not sure if that still a thing or not.